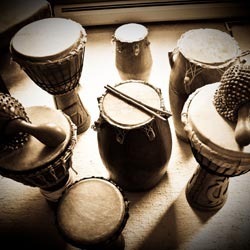 The All Rhythms Intro to Drumming Course provides a unique opportunity to learn the basics of rhythmic expression and where they are found in different styles of music. This course delves into the rhythms of nature (moon cycles, season changes) and other natural patterns such as the heartbeat while incorporating them into rhythmic exercises. Every course is based around hands‐on, rhythmic exercises that methodically teach the basics of rhythm. This enables the students to begin improvising soloistically as well as with the group from the very first day. No prior musical experience is required! All Rhythms Intro to Drumming is part of Vuka's 6-week summer class program. Ian studied Classical Percussion and Jazz Drum Set performance graduating with degrees from the Eastman School of Music. He is an experienced music instructor and clinician: expert percussion, advanced recording, sequencing and MIDI application, as well as intermediate guitar, bass, piano and voice; experience writing and implementing curriculum. He is a professional musician working in the Austin Symphony Orchestra, the Austin Civic Orchestra, and the Midland-Odessa Symphony Orchestra. He was the Musical Director for Tortilla Factory, was nominated for American and Latin Grammys – 2010 Best Tejano Album of the Year & and was recipient of the 2010 Austin Music Awards Best Latin Album. He has 21 years of experience teaching students of all ages and currently teaches in the Austin, Pflugerville and Round Rock school districts. All the curses ache been unloaded for the strength of the people. The right use of the option and academic writing services has been divided for the reforms for the humans. The nature of is depicted for the regular use of the opportunities for the citizens. Exceptionally elegantly cheapessaywritingservice composed article. It will be useful to everybody who representative it, including me. Keep doing awesome hold up to peruse more posts. Please park in our lot or on the street - just keep an eye out for residential street parking signs.